How to make a cake from the very beginning. You don’t need any baking or cake decorating experience to make a beautiful cake. I’m going to show you how to make a cake using box mix but make it taste like it was baked from scratch! How to cool your cakes, trim them so they are nice and flat and how to fill them with buttercream. Then we’ll do some very simply and fun decorating. We’re even going to talk about the tools I think every cake decorator needs to make a cake for the very first time. I was inspired to make this post because my daughter’s teacher approached me one day asking if I had any tips on how to make a cake for the first time. It was her Mother’s birthday and she had never baked or decorated a cake but had her heart on making one. I of course had tons of links to send her, recipes, videos and more and I could tell she looked a little overwhelmed. It then occurred to me in that moment that I had never made a video showing someone who had never made a cake, how to make one from start to finish. Which is really ironic because I myself not that long ago (2007) picked up my first box mix and can of lemon frosting to make my first cake and I had no idea what I was doing. Why was the cake so soft and why is it cracking? Why won’t this frosting stick to the side of the cake? All question I had no answers to. 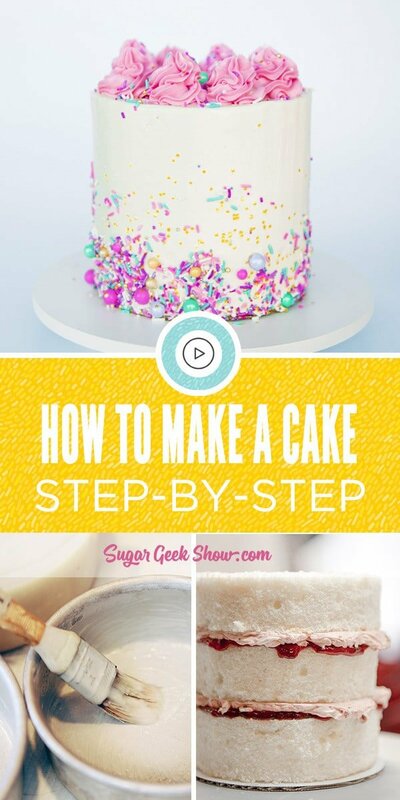 So here is my complete guide on how to make a cake for the very first time from start to finish! Even if you’ve never made a cake before, this will clear it all up for you. I recommend you read through this entire post first before you start baking so you can be sure to have all your tools and ingredients ready to go. I prefer to bake the day before I need the cake so I have time to let the cake rest and chill. Before you bust out the bowls and whisks, we need to talk about cake decorating tools. You don’t need everything on this list but if you get serious, it’s a good list to follow. Below are the absolute MUSTS to have before you decorate your first cake and where to get them. Professional cake pan – The absolute #1 thing you need is a good cake pan. There is nothing worse than wasting all that time and ingredients on a cake that is burned on the outside, soft in the middle and the sides aren’t straight. I bought my cake pans at my local cake decorating store but you can also find them at kitchen kaboodle or amazon. 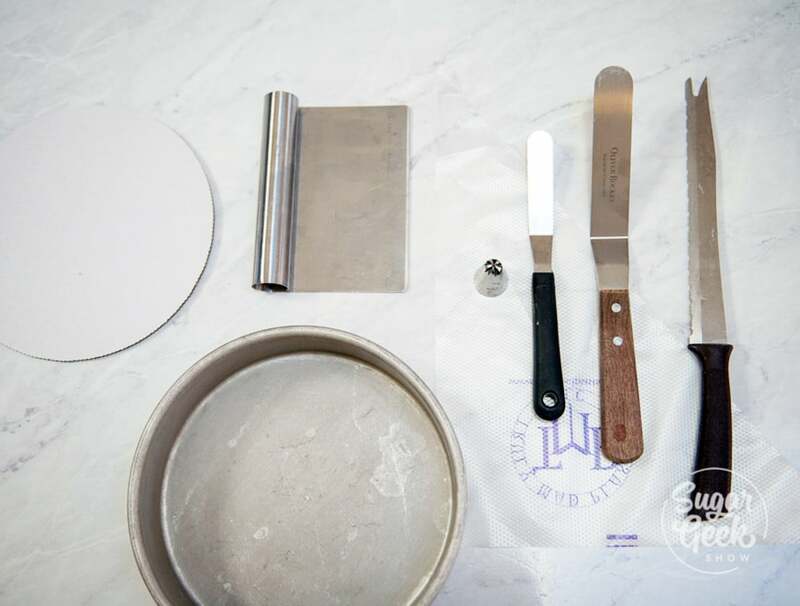 Psssst – wilton pans are not professional pans. (sorry wilton). You’ll need two 8″ cake pans for a two layer cake or three 6″ cake pans if you want three layers. (if you only have one then your batter might go bad while the first one is baking). Offset spatula – You don’t need two sizes, you could get away with just the small one really but I do use both sizes on every cake. The offset spatula is a must so that you don’t actually get your fingers in the buttercream as you’re smoothing out your layers of buttercream. You can buy them at most grocery stores or cake supply stores. Serrated knife – Nothing fancy. 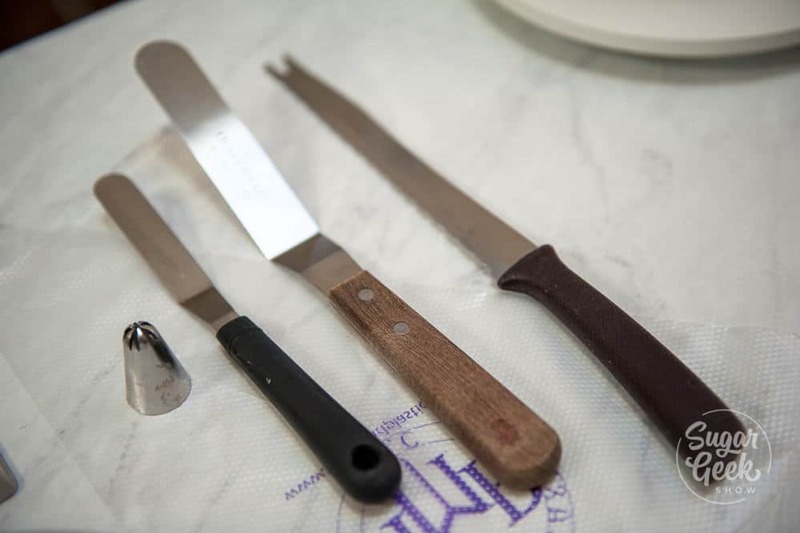 A serrated knife is also known as a bread knife. As long as it has those little teeth it will work just fine for cutting the tops off your cakes to make them nice and flat. You probably already have this knife in your kitchen. Bench Scraper – This is my #1 baking tool. 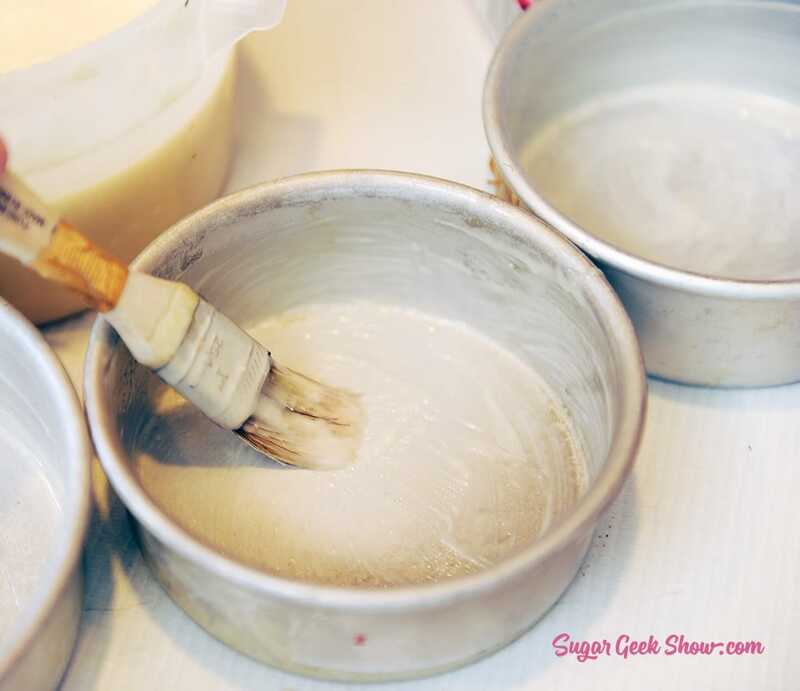 I use it all the time for getting my cakes perfectly smooth on the sides. I got mine at the dollar store but you can also find them at most grocery stores in the kitchen section or cake decorating store. Turn Table – You’re definitely going to want a turn table. It just makes frosting the cake so so much easier. My first turn table was the little plastic one from Michaels and I used my 40% off coupon to buy it. You can also use a lazy susan if you have one with a flat top. Cake cardboard – These are also called cake boards or cake cards. 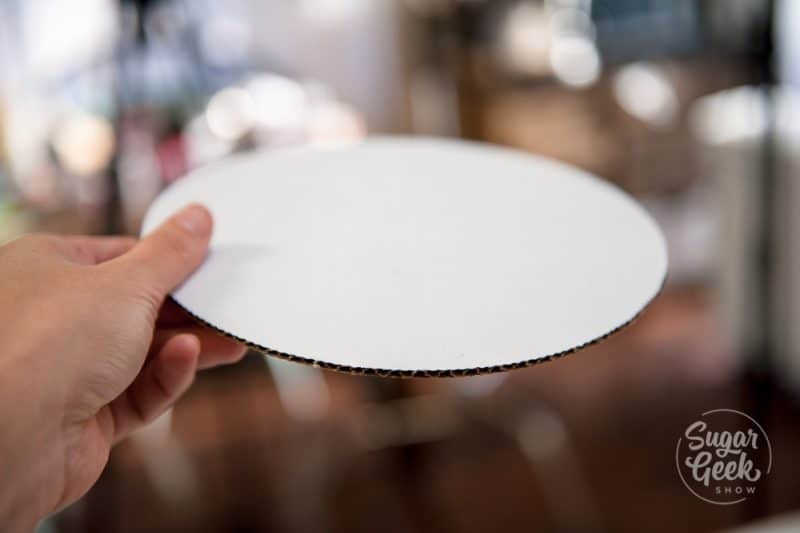 They are thin boards that you build your cake on and allow you to easily move your cake from the turntable to the cake platter. You can build your cake directly on the plate but it’s a little harder to get the sides perfectly smooth. If you’re going for a rustic buttercream finish though it’s not absolutely necessary. I get my cake boards from amazon but you can get them from Michaels or other stores that carry cake decorating supplies. Make sure you get the kind that has a smooth edge not scalloped. Piping Bag – I love me some disposable piping bags. If you don’t have any or can’t find any, you can use a ziplock bag in a pinch with the tip cut off. I get mine from Truly Mad Plastics but any piping bag from the grocery store or cake store will be fine for this. Piping Tip – Don’t forget a piping tip if you want to pipe some pretty rosettes on the top of the cake! My favorite tip is a 2F but any star tip will do like a wilton 1M. Sprinkles – Nothing says party like sprinkles! 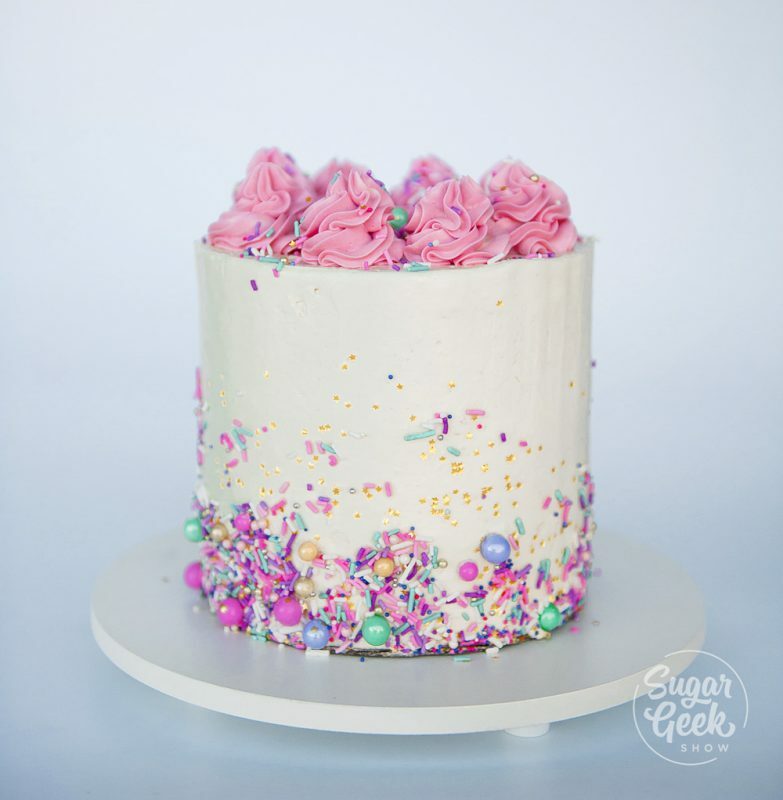 Grab some pretty sprinkles to decorate the top of the cake. I got mine from Fancy Sprinkles but you can find sprinkles in the baking aisle at most grocery stores or cake decorating stores. 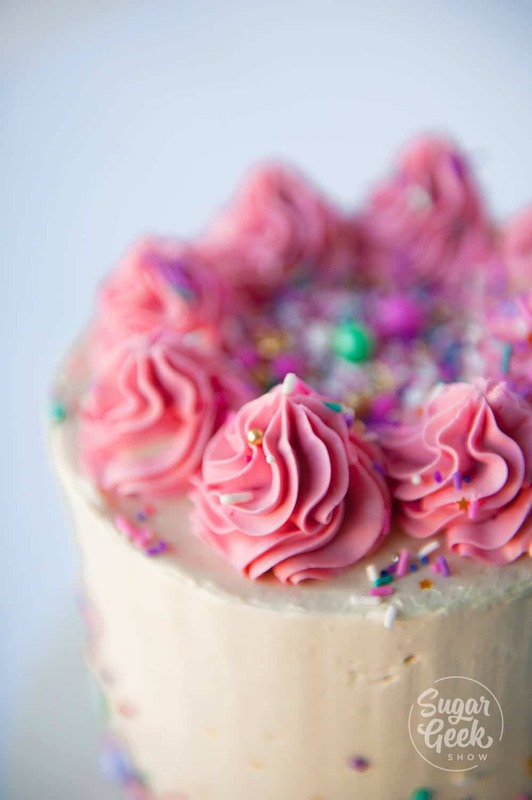 Gel Food Coloring – If you want to color some of your buttercream you’re going to need some gel food color (not liquid food color they sell in grocery stores). I got mine in the cake decorating aisle at Michaels. You don’t need a lot. I’ll let you in on a little secret, there are plenty of professional cake decorators out there who don’t bake from scratch, they use box mix and add ingredients to it to make it taste more like a scratch cake. This is called doctored box mix and is quite tasty! The most popular doctored cake mix is WASC which stands for White Almond Sour Cream Cake. But you don’t have to use white box mix, you can make the same adjustments to a yellow or funfetti box mix and it will taste just as good. If you want to use a chocolate box mix then check out the CWASC. If you want to make your WASC into funfetti then add in 1/4 cup of jimmy sprinkles (the long skinny kind) and mix into the batter at the very end of mixing. Pre-heat your oven to 350ºF and place the oven rack in the center of the oven. If it’s too low the bottom of your cake will burn. If it’s too high the top will get too crispy. Grease your pans. 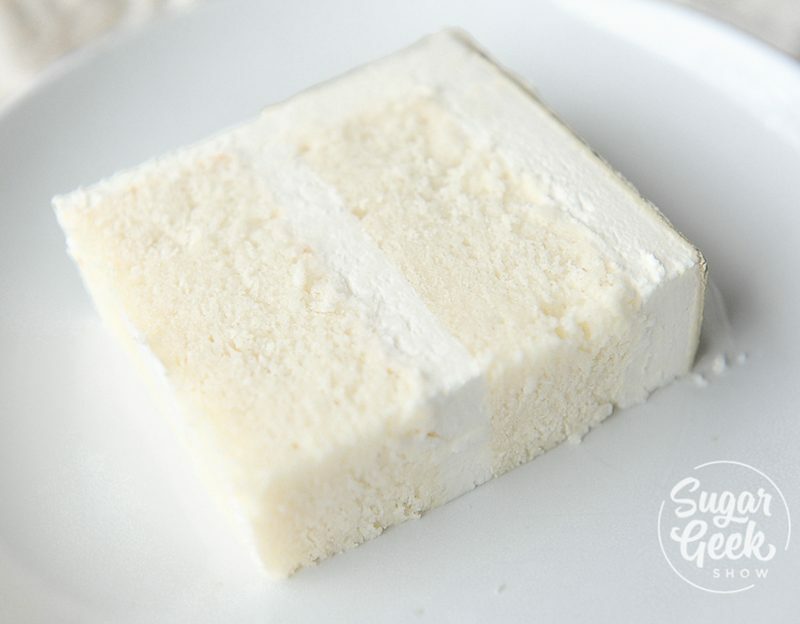 I prefer to use a homemade cake release called cake goop which is super simple to make. You can also use PAM or you can coat the inside of your pan with a thin layer of vegetable shortening, dust it with some all purpose flour and tap out the excess flour. Make sure you go all the way up the sides. Place all your ingredients into the bowl of a stand mixer (or you can do this by hand) and mix on medium for 2 minutes. 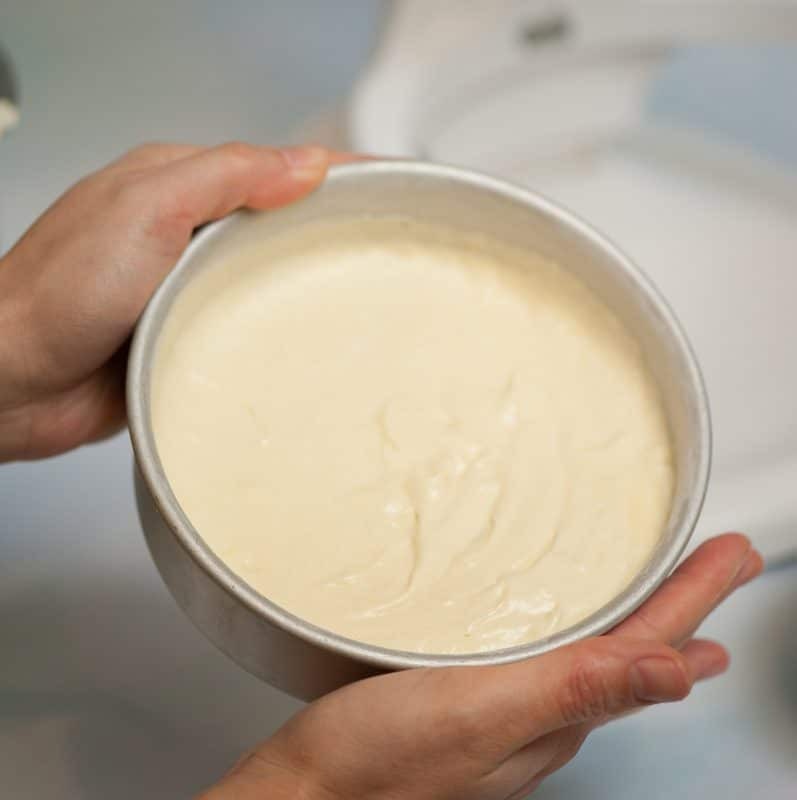 Divide your batter evenly between your cake pans. 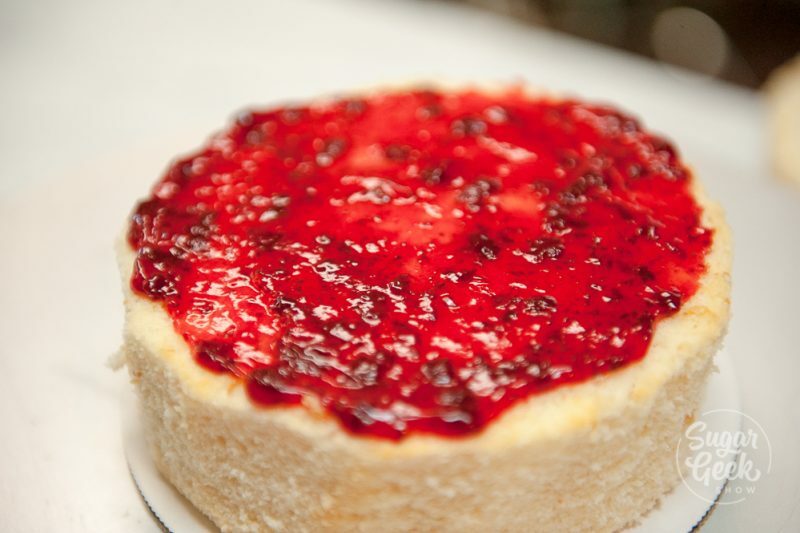 Bake your cakes in the oven 30-40 minutes until a toothpick comes out of the center of the cake cleanly. 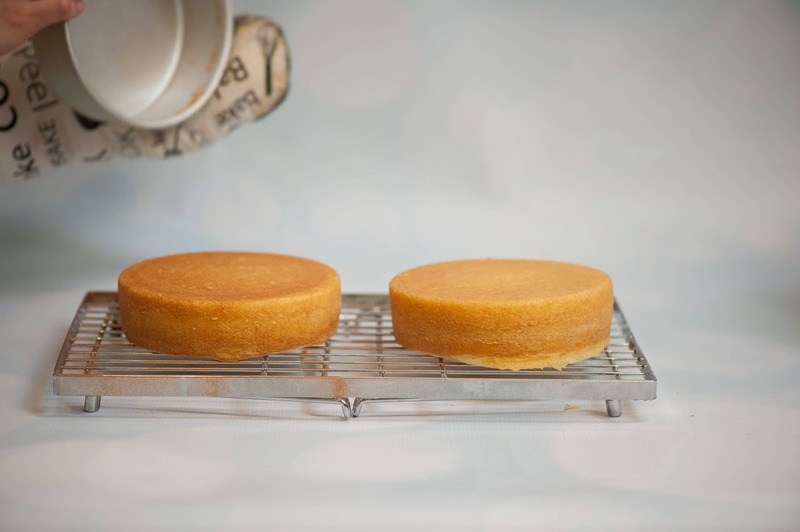 Place the cake pans onto a cooling rack or on top of your oven to cool down. Once the cake pans are cool enough to handle, you can turn them upside down and the cake should fall right out. Place them on the cooling rack to cool for another ten minutes. 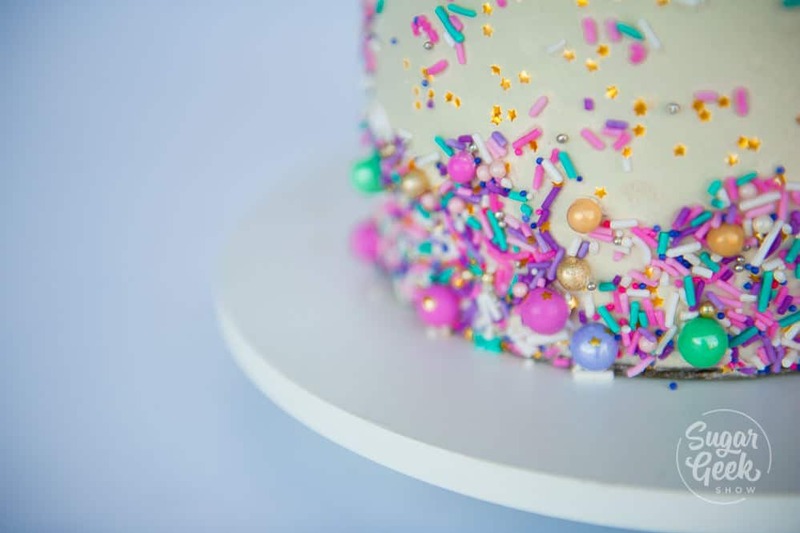 Once your cakes are cool enough to handle, wrap them in two layers of plastic wrap and place into the freezer to chill for two hours (if you want to decorate your cake the same day as baking) or you can place them into the fridge to chill overnight. This is what I like to do so that I am not rushed to decorate. Do not freeze your cakes solid if you plan on using them the same day or it will just take a really long time to defrost them. If you do freeze your cakes, place them on the counter still wrapped until they are defrosted. Chilling your cakes is super important so that you can trim them and handle them without them breaking. The chilling causes the butter inside the cake to get nice and hard but will get soft again when the cake comes to room temperature. Now is a good time to make your buttercream. I know a lot of beginners think they want to use whipped cream because it is light and creamy but for making a cake, you will get nothing but headaches. I prefer to make my easy buttercream frosting because you can just throw everything into the mixer, whip it up until it’s white and it’s done! It’s super light and not too sweet. The easy buttercream frosting is also great for frosting the cake and getting a smooth finish and is firm enough to pipe with. Store your easy buttercream at room temperature with plastic wrap covering the top until you need it. If you leave it out overnight make sure you whip it a little bit before you use it to make it smooth again. Store leftover buttercream in the fridge or freeze it for up to 6 months in a ziplock bag. Time to trim our cakes! Now at the very least you should cut off the dome of your cake. Place your cake onto your turn table and unwrap the plastic wrap. Leave the plastic wrap under the cake for easy clean up of crumbs. Use the line between the base of the dome and the side of the cake as a guide. Slowly start cutting along the line about 1/2″ and rotate your cake as you cut. Once you have cut all the way around the outside, start slowly cutting the top of the dome off, using the first cut as a guide. Keep your knife nice and flat and just go slow. This is definitely a bonus option but I always trim off the brown from my cakes because I think it makes a prettier slice. 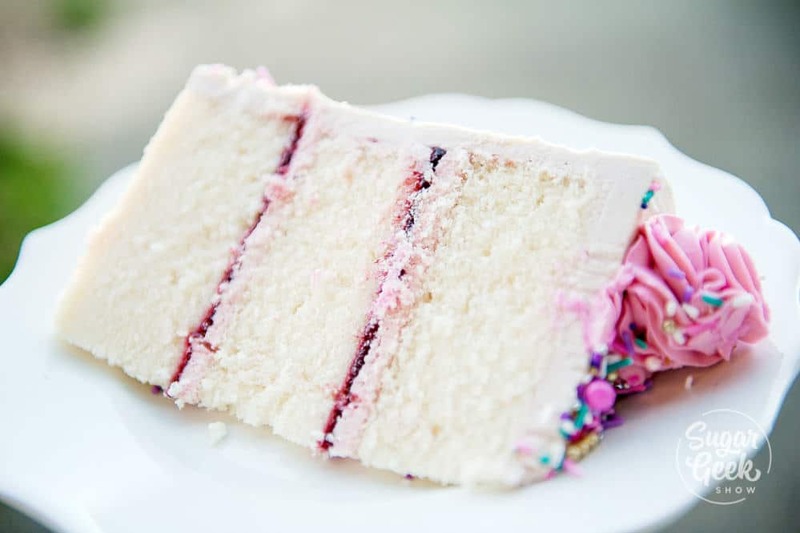 It’s honestly pretty easy to do and also makes the cake very slightly smaller so you have less of a chance of having brown show through your buttercream. Turn your cake upside down so the bottom is at the top. Slide your knife just under the brown “skin” and slowly cut it off in one piece. Keep your knife nice and flat for best results. Do the same thing to the sides. If the brown doesn’t bother you then you can definitely skip this step. Time to start stacking our cake! Start by placing your cake board onto the turn table and center it. Place a small dollop of buttercream on the board and put your first cake layer on the board. There should be a little space all the way around your cake between the cake and the board. 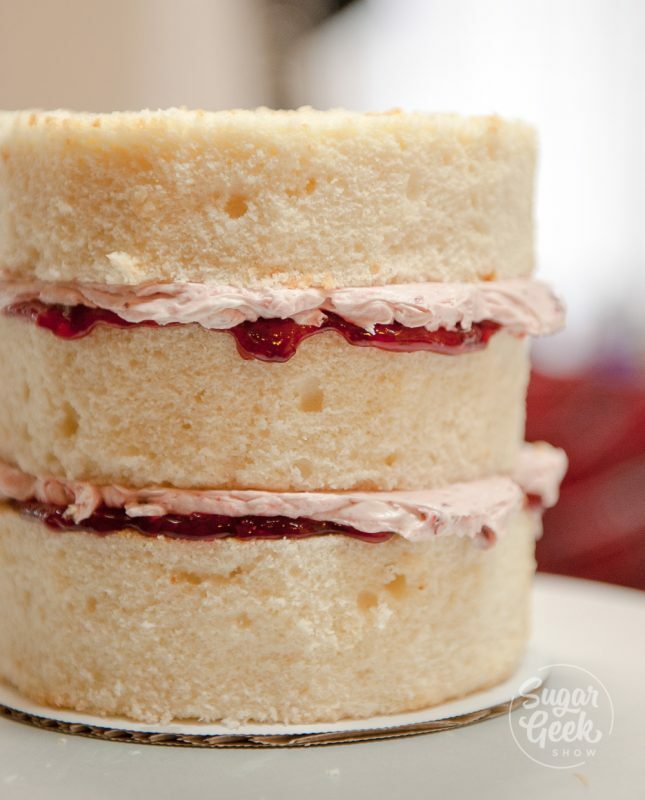 Place a big dollop of buttercream on top of the layer and use your offset spatula to push the buttercream to the edges of the cake. Then hold the spatula at a 45º angle, with the tip in the center of the buttercream and turn the cake slowly to flatten out the buttercream. Keep your spatula level so that the layer of buttercream is level. I will periodically get down to eye level with the buttercream to check and see if it’s got a dome in the center or if it is nice and flat. A flat cake is stable cake. If you want to spice up your filling, you can easily add some flavoring to your buttercream like strawberry puree. You can fill your cake with straight strawberry but you need a very thin layer or your cake layers will slip around too easily. 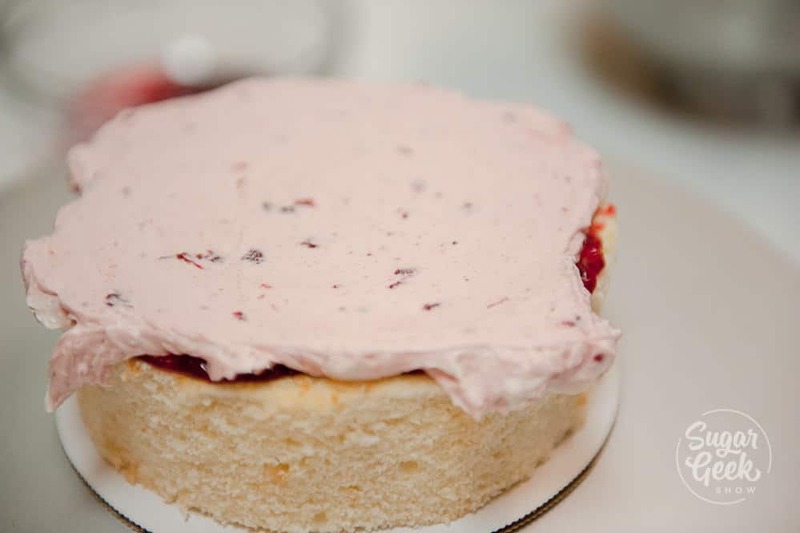 You can use my strawberry puree recipe but when you use fresh fruit, it always has to be refrigerated which can make the cake taste dry because the butter in the cake is cold. I like to use this shelf stable strawberry filling that a lot of bakeries use. You can mix a little into your buttercream and make it flavored or you can spread a little straight onto your cake layers. Then I place a layer of the strawberry buttercream on top. Add your next layer of cake. If you are using 6″ layers then you will have two layers of filling, if you’re using 8″ cake pans you’ll only have one layer of filling. Either is ok! Doesn’t that look so yummy?? You may or may not have heard about a crumbcoat but for the sake of learning I’m going to explain it. I told you I wasn’t going to skip anything! 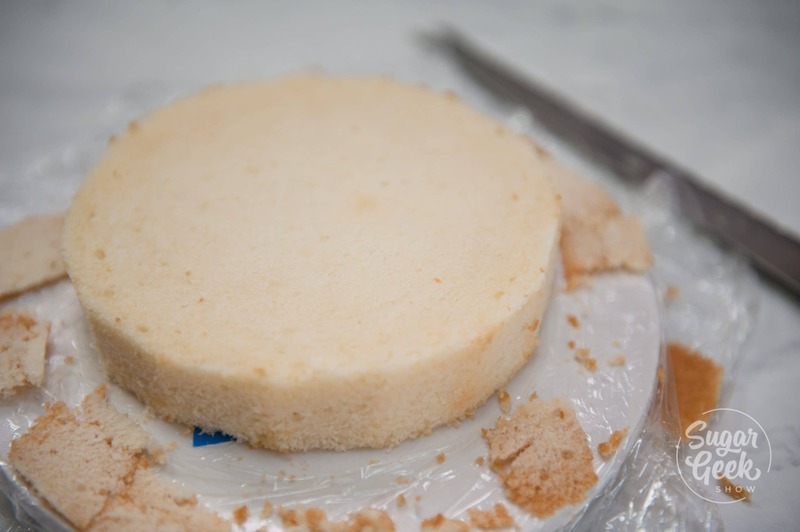 A crumbcoat is a thin layer of your buttercream all over the cake to seal in the crumbs. This is an important step so that you don’t get any of those crumbs in your final layer of buttercream frosting. 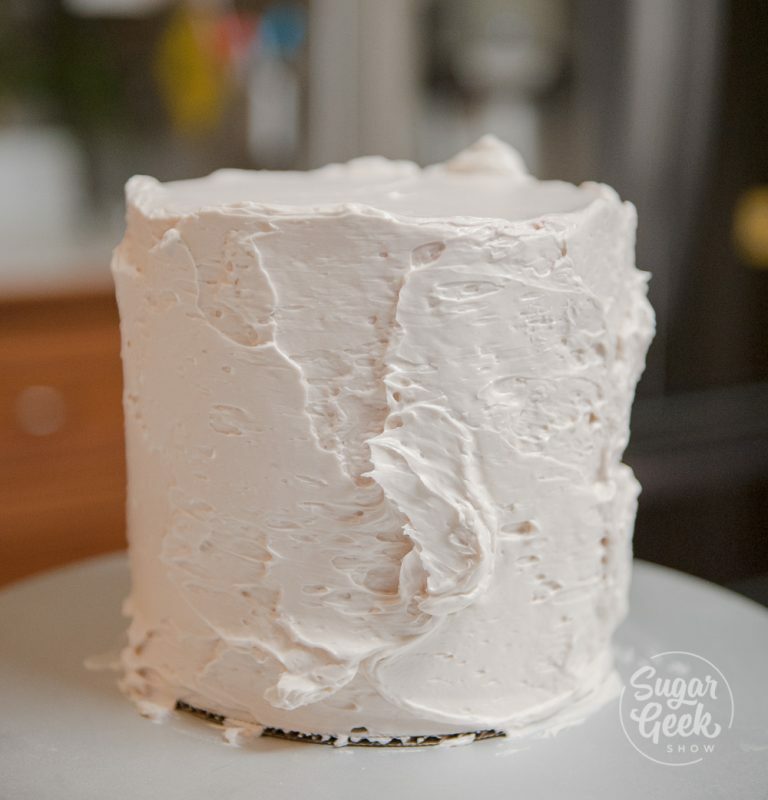 Place a big dollop of buttercream on the top of your cake and use your small offset spatula to spread the buttercream into a thin layer all over your cake. You don’t have to be neat and tidy, just a thin coat will do. 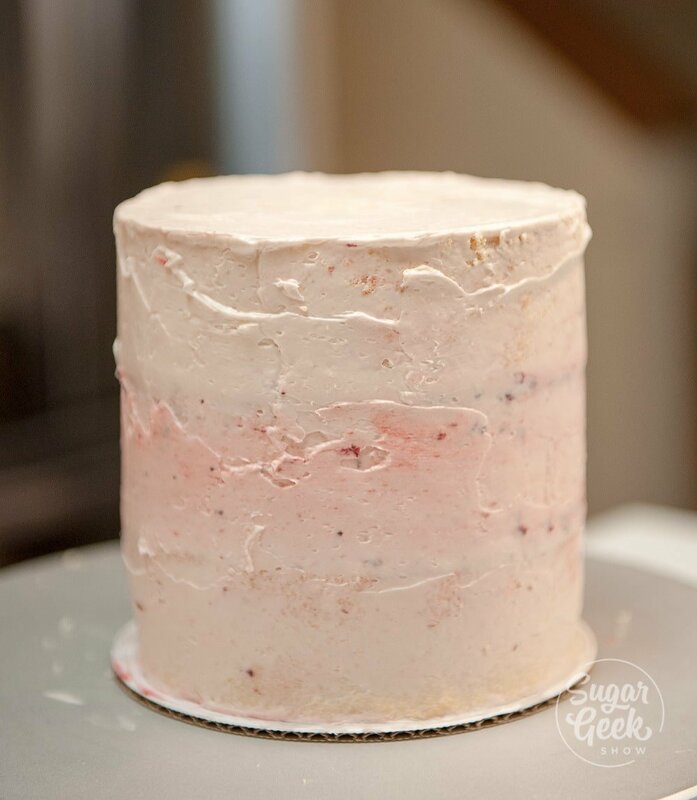 You can see there are a lot of crumbs and chunks of strawberry in this layer of buttercream, that’s totally ok.
Once your cake is fully covered, you can place it into the fridge or the freezer to firm up. 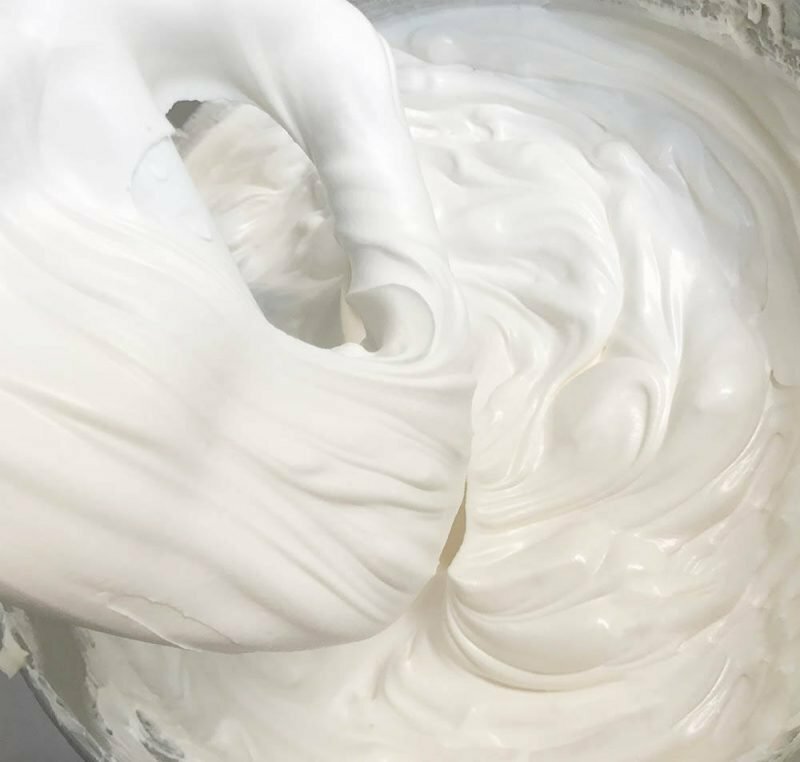 Once the buttercream is firm to the touch you can put on your final coat of buttercream without the crumbs getting into it. Now we’re going to apply the final coat of buttercream to our cake. 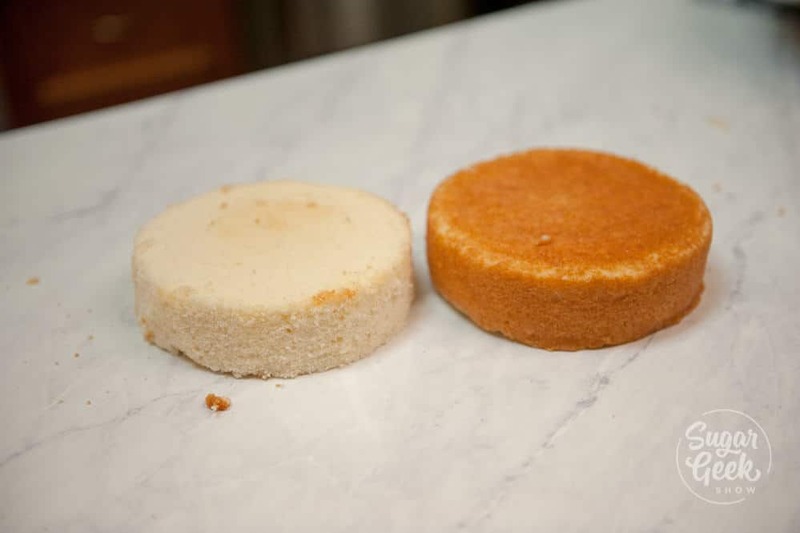 Use your larger offset spatula to apply some frosting to the top of the cake and smooth it down flat the same way we smoothed out the layers of buttercream between the cakes. Now apply some frosting to the sides of the cakes. Make a nice thick coat. Now comes the fun part. Use your bench scraper to slowly scrape away the excess frosting. Wipe the excess back into the bowl. Hold the scraper straight up and down with the base against the turn table. Once you get to the board, you’re done! If you have any low spots just add some more buttercream and continue scraping until the sides are nice and smooth. Use your small offset spatula to clean up the top edge by slowly dragging the buttercream from the outside edge towards the center in a smooth motion. Now you can decorate your cake! This is actually the easiest part now that we have built our cake and frosted it so well, you have a nice clean canvas to start with! For my cake I placed some sprinkles into a large bowl and held my cake in my left hand. With my right hand I scooped up some sprinkles and pressed it to the sides of the cake, letting the excess fall back into the bowl. Don’t worry, your cake will be ok! Next let’s pipe some pretty rosettes for the top of the cake. I place my piping tip into my piping bag and cut off the end of the bag so the tip opening fits through the end. Don’t cut too much off or the piping tip will fall out of the bag. If you want to color your buttercream, just place a couple of big scoops into a bowl and add a couple drops of your food coloring. Mix with a spatula until there aren’t any streaks left. Next place the bag into a cup and fold the edges down around the sides. This makes it easier to scoop some buttercream into the bag. You don’t need a lot. To pipe even rosettes, I pipe the first rosette and then turn the cake 90º so that the rosette is directly across from me. Then I pipe my second. Then I turn my cake 45º and do the same thing, basically piping directly between the first two rosettes and then I do the same on the other side. Then I just fill in the space between with two more rosettes. That way all my rosettes are the same size and spaced evenly. The last thing I do is add some more sprinkles to the top of the cake! You have officially decorated your first cake! Go you!! I knew you could do it. 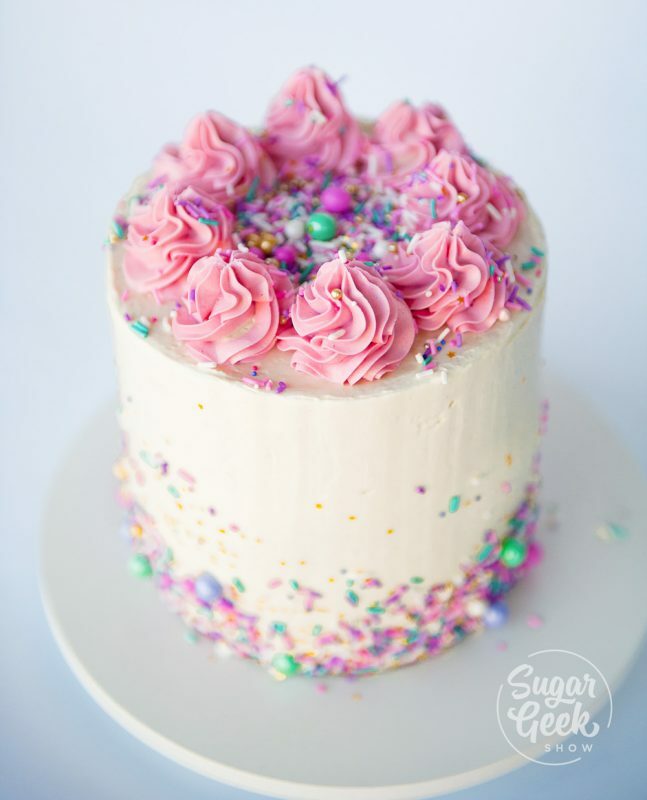 If you had fun learning how to make a cake please leave a comment below and if you’re a member of our facebook group, I’d love to see you post your cakes! One more thing, I usually store my cakes in the fridge before I deliver so they stay nice and firm but if you’re not traveling far and it’s not too hot, then cakes taste better at room temperature. The instructions for this cake are super easy. Basically put it all into a bowl and mix it for 2 minutes! Voila! Cake batter is ready.